if you were EVE’s new Executive Producer, where would you take the game? Is there anything in EVE’s ten year past that should be resurrected? Or buried and forgotten? Looking back, I realize that perhaps I hadn’t seen the big picture. 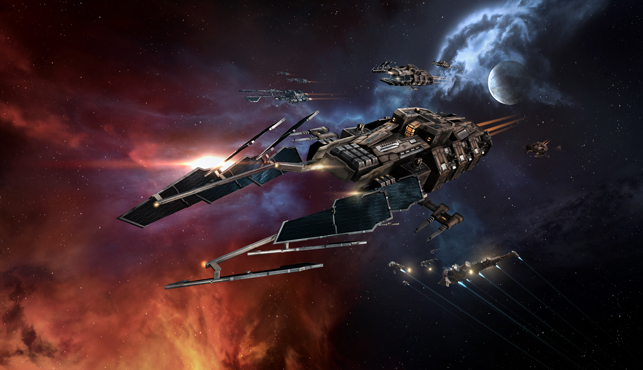 There were some things that developed during EVE’s second decade that simply could not be anticipated. Still, as EVE Online’s Executive Producer during that period, I’d like to say my successes outweighed my failures. Sure, at first, there were the usual community cries of favourtism, but that faded away by the end of year one. By then, CCP Seagull and I had taken center stage at Fanfest to unveil the detailed plans we had aligned ourselves with for the coming years. I had always been partial to the second view. I can still remember the dinner sessions, the round-table discussions, the yelling matches from all parties involved that the focus of EVE would always have to remain the player; that the player was what made EVE stand apart from everything else before and after. EVE’s strength would always be its players, its community, but the game stood apart from everything else for many reasons, the least of which had always been its grand vision of a dystopian future. It was all three dimensional cardboard cutouts without any heart. Hilmar finally backed my decision and even though were still squabbles for several months, we worked together towards building a living universe. New Eden would never be the same. When we announced the 24th expansion to EVE Online, titled Evolution, focused solely on creating a living universe, it wasn’t well received. There was even some talk afterwards of changing direction. I managed to hold us firm. I’m glad I believed in myself that much. Evolution turned out to be a colossal success. Subscriptions increased tenfold. It was a golden era like no other for CCP. We assigned a dedicated team to World of Darkness and brought that vision to life. We re-imagined DUST 514 for XBox One, PS4 and PC. We released Valkyrie and the world held its collective breath in awe. Living, breathing players pitting themselves against living, breathing NPC AI. The struggle continued until midway through year eight of my tenure. At the height of my career was when it happened. New Eden stopped accepting inputs. We couldn’t turn it off. We couldn’t stop it. It spread so quickly that our world didn’t have a chance. You had my vote regardless of what happened at “Dust 514 for…PC”. Also why not just incorporate the already existing Dust features and build on those. Combat where you take over stations, and then swap to a ship as the fight becomes dire outside, or exploring an abandoned space station with friends combating rogue drones as you look for rare salvage or lost technological blueprints. Walking in stations is no longer a jerky stiff-man action but a smooth process!